Eyebrow Embroidery: Creating an entirely new eyebrow shape? It doesn’t sound right, does it …embroidery in your eyebrows? You might also know it now by a few other names, like semi-permanent tattoo, micropigmentation, or semi-permanent make up. If you haven’t heard of it, I don’t blame you. Until I stumbled across this about a year or so ago (after more than 7 years in the industry, and now as a professional eyebrow consultant), I had never heard of it. 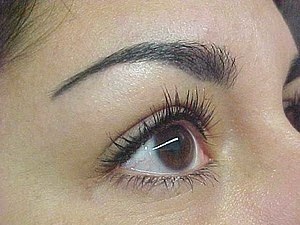 Put simply, eyebrow embroidery is a new cosmetic tattoo technique, that is semi-permanent. The reason that this form of cosmetic tattoo is only semi permanent, is because the tattoo ink is precisely deposited into the top layers of the skin only – the epidermis – about where pigmentation sits (not down into the dermis like permanent tattoos). The benefit of this, is that much finer strokes are possible, so the artist can create almost brand new eyebrows, because the result looks like natural hair strokes. This differs from traditional cosmetic tattoo, because there is a much finer precision. Also, the tattoo won’t bleed into the skin over time, creating that greenish tinge and faded outline. Good eyebrow embroidery artists will correctly match your colour, and also create light and shade within the shape, to make them look even more real. This is good to keep in mind if you have a disaster eyebrow wax resulting in a painstakingly long recovery process (once those terminal hairs are removed accidentally from your eyebrow, they seem to take months and months to grow back to normal) – but eyebrow embroidery certainly could create a fix that’s permanent enough to last you until those hairs grow back! Eyebrow embroidery can also help you if you have NO eyebrows… or very sparse ones. It’s not cheap, places charge about $500 (that’s a very rough average) – but some places will also include a follow-up visit, and will draw the shape on in the consultation process so you can make sure that the eyebrows you are about to have embroidered on are right for you. Hi thanks for this very informative article. Ive been wanting to have an eyebrow tattoo for a long time and think this has some good information about it too http://beauty247.com.au/cosmetic-tattoo/eyes/ .